Jaguar, Honda and Jeep were Europe's fastest-growing brands last year because of strong demand for SUV/crossovers. 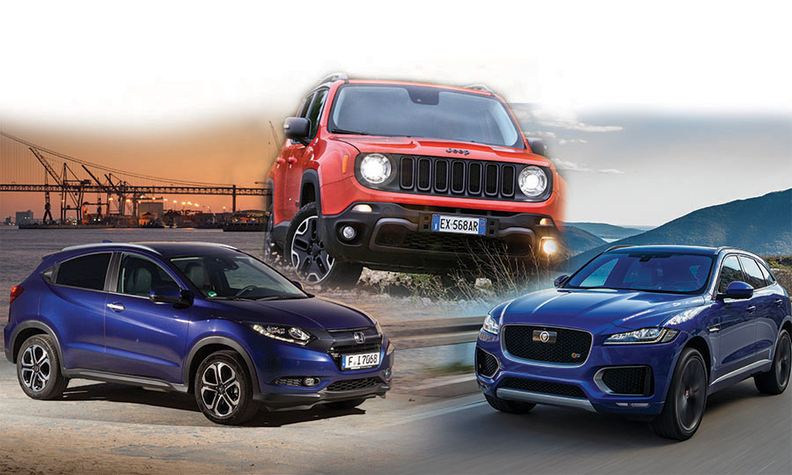 The F-Pace (right) gave Jaguar a lift; the HR-V (left) boosted Honda; and the Renegade (center) was Jeep's best-seller in Europe. Jaguar, Honda and Jeep were the biggest winners last year among brands sold in Europe, where overall vehicle sales rose 6.5 percent to 15.1 million, easily exceeding initial analyst expectations that the region’s volume would increase by a maximum of 4 percent. The reasons for the better-than-expected sales were Europe's overall economic improvement and the strong rebounds of the Italian and Spanish markets, which were up 16 percent and 11 percent, respectively. Also France (+5.8 percent) and Germany (+3.7 percent) performed ahead of expectations. The UK's long growth streak ended as volume declined by 1.1 percent. The slowdown came in the second half after British voters decided the country should leave the EU. Uncertainty about the effect of Brexit has influenced predictions for new-car sales in Britain and beyond. "Looking ahead, we are forecasting lackluster 2017 European growth of only 0.5 percent, based on our weak outlook for the UK down by 8 percent and a flat German market," Arndt Ellinghorst of Evercore ISI wrote in a note to investors. Jaguar was Europe's fastest-growing brand with a gain of 71 percent last year. The rise was largely because of high demand for the F-Pace, the British automaker's first SUV. The F-Pace accounted for 18,000 of Jaguar's 28,000 additional sales, boosting its total volume to 68,687. Honda is credited with creating the small crossover segment in Europe with the first-generation HR-V that it launched in 1998, but it left the sector in 2006. Honda's return to the segment last year with its second-generation HR-V has paid quick dividends. The HR-V helped Honda boost its European volume by 25,000 units to nearly 160,000 sales. The 21 percent gain on 2015 made Honda Europe's second-fastest-growing automaker last year. Rounding out the top three brands based on year-on-year growth was Jeep, which increased sales 19 percent because of strong demand for its Renegade subcompact SUV, which helped the automaker increase its sales by 20,000 units. 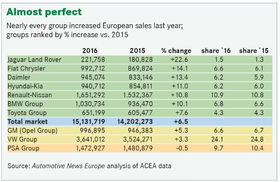 The overall surge in European sales lifted 27 of the 33 brands tracked by the European automakers' association, ACEA. In addition, 21 of the 27 grew more than the overall market. The biggest losers were PSA Group's DS Automobiles and Mitsubishi, which both slid slightly more than 12 percent. Volkswagen Group's admission in September 2015 that it had cheated on emissions tests had a significant effect on sales at the automaker's namesake brand last year. VW remained Europe's No. 1 brand by a wide margin, although its sales declined by 0.4 percent in an overall market that was up by 6.5 percent. More importantly, the brand's market share fell to 11.4 percent last year from 12.2 percent in 2015 and from 12.5 percent in the year that preceded the automaker's biggest business scandal to date. Pushed by the success of volume models such as the Clio and Capture and strong sales of new entries such as the Kadjar and Talisman, Renault accomplished its target of becoming Europe's second-largest brand after VW. Renault passed Opel/Vauxhall in 2015 for No. 3 and rose above Ford last year to land at No. 2. The French automaker increased sales by 13 percent to 1.1 million units, while Ford was up 2.9 percent to 1.04 million, according to ACEA's figures. At group level, for the second-consecutive year Jaguar Land Rover outgrew all rivals. The luxury carmaker increased sales by nearly a quarter to 221,758 units in 2016. In the last two years JLR has boosted sales 53 percent compared with the 144,442 units it sold in 2014. Jaguar accounted for 28,000 of JLR's 41,000-unit sales increase last year. The biggest contributors where the new F-Pace midsize SUV and XE midsize sedan. Fiat Chrysler Automobiles came in second as sales climbed 14 percent to 992,712 units. Alfa contributed a mere 10,000 units to FCA's 123,000-unit growth, as most of the group's increase last year came from the Fiat brand (90,000) and Jeep (16,000). Helped by the Mercedes-Benz brand and the continued growth of small-car unit Smart, Daimler was third in year-on-year sales growth by a group. The German company's sales were up by 13 percent to 945,074 units last year. In the overall group ranking, VW kept its commanding lead with full-year sales of 3.64 million vehicles, but just two brands, Audi and Skoda, grew at a faster pace than the overall market. As a result, VW Group's share slid to 24.1 percent from 24.8 percent in 2015 and from 25.5 percent in 2014, when Europe's largest automaker was accounting for one out of every four sales in the region. Renault-Nissan remained Europe's second-largest automotive group with a volume of 1.65 million units and a share of nearly 11 percent. PSA kept its No. 3-position with a volume of about 1.5 million sales, but it was the only automotive group in Europe that had a sales decline. PSA CEO Carlos Tavares has said that his goal is to protect profitably ahead of increasing unit sales. Volume was down by 0.5 percent but in a market that grew 6.5 percent, this translated into a share decline to 9.7 percent from 10.4 percent in 2015. This widened the sales gap between the French groups as Renault-Nissan last year outsold PSA by almost 180,000 vehicles, up from more than 51,000 in 2015. Although European sales rose by nearly 930,000 last year, the region's 2016 volume remained almost 900,000 sales below the 16 million total reached during the market's peak in 2007. In effect, the 2016 increase preserves the existence of six vehicle assembly plants each with capacity to produce 150,000 units a year. One of the key indicators of an automaker's success is its ability to keep its plants at or near production capacity. A factory needs to produce at 75 percent to 80 percent capacity to break even, according to industry experts. If the manufacturer's entire network of plants is producing below that number, it is nearly impossible for the company to make a profit. Ford, Opel, Volvo and PSA/Peugeot-Citroen closed car plants during Europe's six-year sales slump (2008-2013), but analysts estimate that the region still has about 20 percent more production capacity than is needed to satisfy customer demand. A closer look at full-year European sales figures provides some additional insights. Along with reclaiming the title of world's top-selling premium carmaker last year, Mercedes returned to being Europe's No. 1 in that category. With a volume of 839,779, Mercedes finished ahead of former No. 1 Audi, which sold 830,956 vehicles in Europe last year, and BMW (821,525). 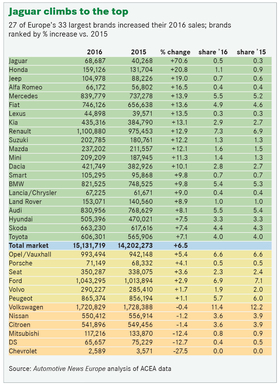 The gap separating the top-selling premium automaker in Europe from No. 3 narrowed to just 18,000 units from 29,000 in 2015. The three German premium brands continue to be Nos. 6, 7 and 8 in the overall ranking ahead of volume brands such as Fiat, Skoda, Toyota, Nissan and Citroen. The gap between the German premium brands and their closest luxury rival – Volvo – widened to more than 530,000 sales from a 450,000 in 2015. Toyota increased its lead over Nissan in the race to be Europe's No. 1 selling Asian brand to almost 56,000 units from a tight 9,000 in 2015. Toyota's margin last year was similar to the 50,197 advantage it had in 2014.